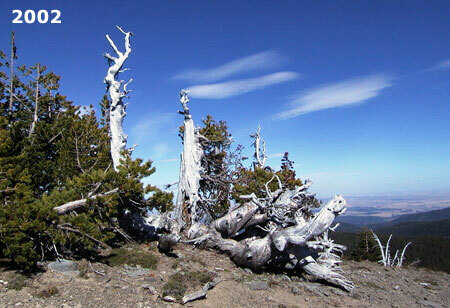 If you have spent much time in Mount Hood’s alpine country, you probably already recognize the Whitebark pine. 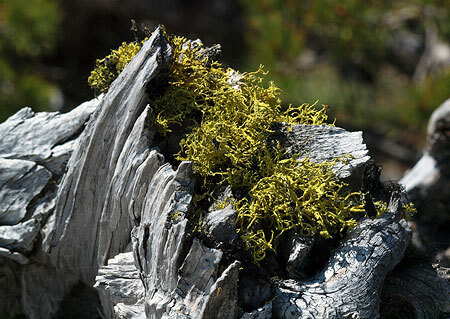 This rugged cousin to our more common Ponderosa and Lodgepole pines thrives where no other trees can, braving subzero winters and hot, dry summers at the upper extreme of timberline. 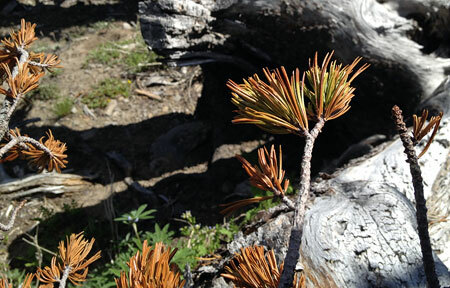 Whitebark pine is easy to identify on Mount Hood. True to their name, they have white bark on younger limbs, and their typically gnarled, picturesque forum is iconic in our Cascade Mountain landscape. These slow-growing patriarchs often live to 500 years or more, with some trees known to survive for more than 1,000 years. In protected stands below the tree line, they can grow 60-70 feet tall (around Cloud Cap Inn), while in open areas, they creep along the ground, forming a “krummholz” — a low mat of branches stunted by the elements (famously, on Gnarl Ridge, which draws its name from the ancient Whitebarks that grow there). 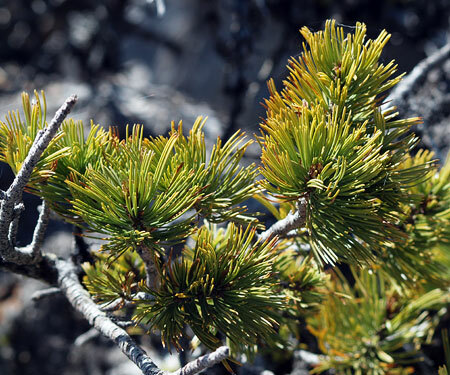 Up close, Whitebark pine can be identified by its needles, with five per bundle (compared to two for Lodgepole and three for Ponderosa pine). 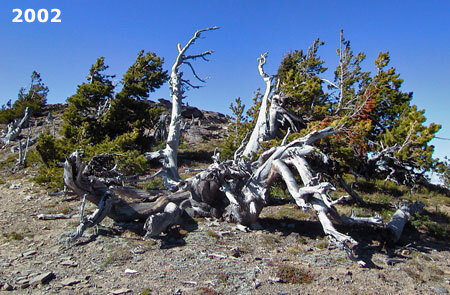 Whitebark cones don’t open when dry, yet are hardly ever found intact. That’s because of the unique, mutual relationship these trees have with a bird called Clark’s nutcracker, named for William Clark, co-captain of the Lewis & Clark Corps of Discovery expedition. Clark’s nutcracker subsists almost entirely on the large, nutritious seeds hidden in Whitebark cones. These birds have evolved with an ability to crack the cones and store the seeds in buried caches, for later consumption. The Whitebark pine, in turn, is almost completely dependent on these birds for reproduction, when young seedlings sprout from seeds cached by the nutcracker. 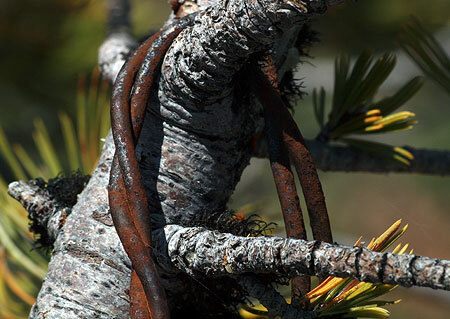 In this way, the Whitebark pine is considered by scientists to be a “keystone” species at the center of a broad, highly dependent web of life. In addition to its co-mutual relationship with Clark’s nutcracker, Whitebarks also support other high-elevation species, serving as “islands” of life in otherwise barren alpine zones. These islands shelter mammals, birds and insects migrating through alpine areas and serve as permanent habitat for many mountain plant and animal species. 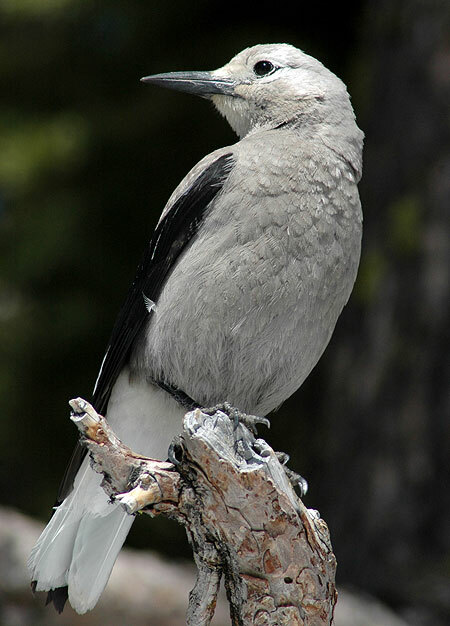 Whitebark pine seeds serve as a direct food source for several other species in addition to Clark’s nutcracker. The seeds are large and high in fat, and at least 12 species of birds are known to feed on them. The seeds are also a primary good source for ground squirrels living in alpine zones, where they store large quantities of seed in “middens”. Surprisingly, Whitebark seeds are also an important food source for black bear and the grizzly bear, with both bear species raiding the middens of ground squirrels. For grizzly bears in the Greater Yellowstone Area, Whitebark pine seeds are considered so important in the their diet that the long-term viability of the bear population is linked to the survival of the Whitebark. 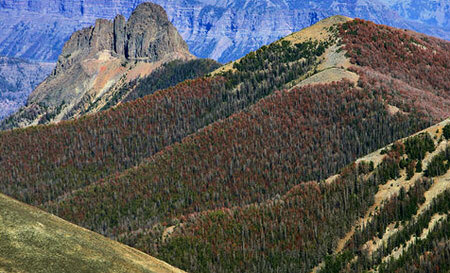 Sadly, the Whitebark pine is in deep trouble. 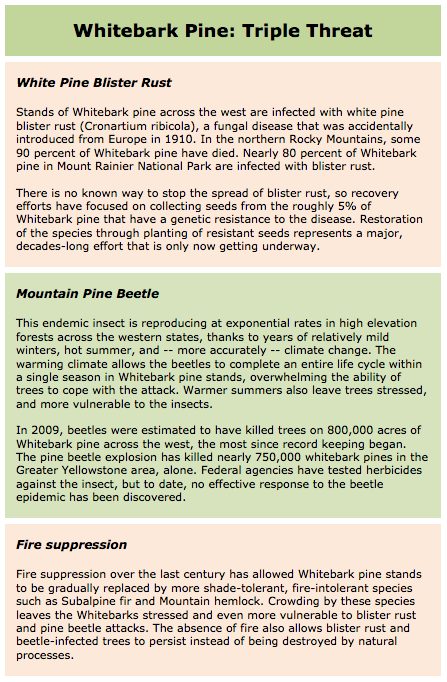 The triple threat of (1) an exotic fungal disease known as white pine blister rust, (2) mass infestations of mountain pine beetle and (3) the effects of fire suppression have weakened and killed millions of these trees across Mountain West. The U.S. 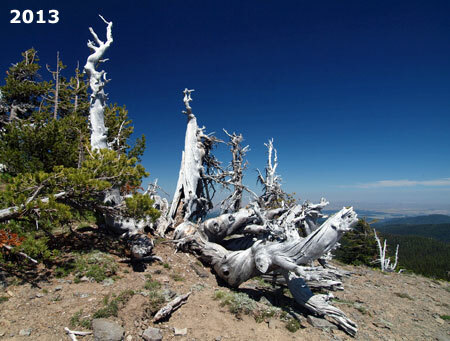 Fish and Wildlife Service (USFW) estimated in 2007 that 800,000 acres of Whitebarks have been lost across the west, an startling statistic given the small, rare alpine habitat that these trees need to survive. Global warming may turn out to be the nail in the coffin for this venerable species, as less hardy tree species continue to crowd and compete for space in areas once habitable only by the Whitebark pine. Several efforts to save the species are underway. In July 2011, the U.S. Fish and Wildlife Service (USFWS) determined that the Whitebark pine needed federal protection and that without it, the tree would soon be extinct within as few as two to three generations. However, the tree has not been formally listed in the United States as endangered, due to federal agency funding constraints. 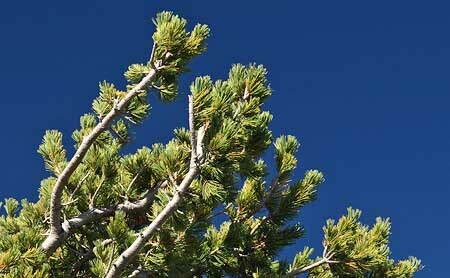 In June 2012, the Canadian federal government declared Whitebark pine endangered, making it the first tree species to be declared endangered in Western Canada. The Whitebark Pine Ecosystem Foundation is a science-based, non-profit organization that exists to conserve and restore the Whitebark pine, but their efforts are dependent on support from the public in making the survival of this species a priority with our land management agencies. 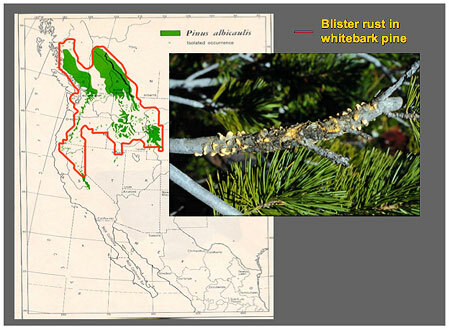 Conservation efforts for the Whitebark focus on harvesting seeds from trees that seem to have a natural resistance to white pine blister rust and restoring the role of fire in forest management. Both strategies will require the full engagement of our federal land agencies, and thus the need for a non-profit like the Whitebark Pine Ecosystem Foundation to press the issue in our utterly dysfunctional national government. Please consider supporting them! One of the best places to view ancient Whitebark pine up close is along the crest of Lookout Mountain, located due east of Mount Hood. 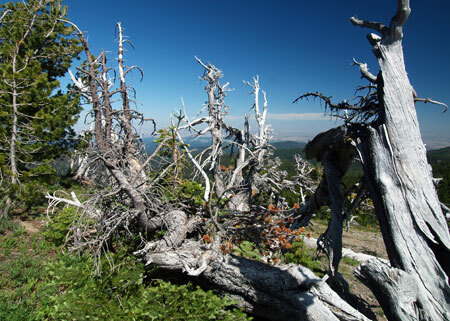 Like most Whitebark stands around Mount Hood, the trees on Lookout Mountain are in decline, yet hundreds have (so far) survived the triple threat facing the species. The Lookout Mountain grove is on the hot, dry south slope of the peak, so the trees here are clearly stressed by the environment, even without the blister rust and beetle attacks now affecting the species. On the more protected east slope of the main summit, a remarkable group of ancient Whitebark pine (pictured below) is soldiering on, though some of the oldest sentinels in this group now seem to be fading fast. Some of the trees in the eastern group are truly ancient. Several were cut in 1930, when a road was built to the summit and a lookout tower constructed. Amazingly, the bleached stumps of these old trees still survive, more than 80 years later. One of these stumps measuring about a foot across still shows its growth rings, showing that it was 280 years old when it was cut in 1930! This means the tree started life on Lookout Mountain in 1650, twenty years before the Hudson Bay Company was formed under a charter from King Charles II. This tree was already 174 years by the time Dr. John McLoughlin established his Hudson Bay Company outpost at Fort Vancouver, in 1824, and more than 200 years old before tiny Portland, Oregon was incorporated in 1851. 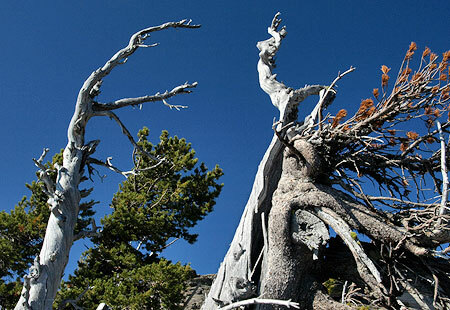 A particularly ancient patriarch in this grove (shown in the photo pairs above and below) grows due east of the summit, along the Divide Trail. This old survivor appears to be the oldest Whitebark pine on Lookout Mountain. While it’s age is unknown, the diameter of its multiple trunks substantially exceeds that of the nearby cut trees, so this ancient sentinel could be 300-500 years old, or more. Sadly, this old veteran is fading fast, with only one living trunk surviving as of this summer. Even as the old tree succumbs to the elements, it continues to serve as a fascinating, beautiful testament to the struggle that Whitebark pines face in their preferred habitat. A closer look at the old tree (below) shows five sprawling trunks, each more than a foot in diameter. This old survivor looks a bit like a huge, grey octopus (complete with two weathered eyes, looking back at you!). Ancient Whitebarks at this elevation are typically a twisted tangle of living and dead trunks, and in the case of the Lookout Mountain patriarch tree, only the north and east of the five main trunks survive. As the photos that follow illustrate, the north trunk may have seen its last summer this year, as its remaining needles suddenly died back as of early July. The surviving east trunk is in better shape, with several green boughs, but its needles obviously lack the vigor of nearby, younger Whitebarks. Clearly, the old giant is in its final years of living after centuries on this unforgiving mountain slope. As discouraging as the plight of the Whitebark pine might be, the efforts by our federal land agencies and the Whitebark Pine Ecosystem Foundation provide at least a shot at saving the species — and the complex alpine ecosystem that it anchors. The saga of the American bison provides some encouragement. The species numbered 60 million prior to western expansion, but was decimated to an estimated 541 animals before protection and restoration efforts began in earnest. Today, about 500,000 bison are known to exist, with about 15,000 restored as wild herds. Hopefully, a similar success story for the Whitebark pine will be recounted by future generations, thanks to our current efforts to save the tree. The loop hike to Lookout Mountain from High Prairie makes a fine summer outing for families. 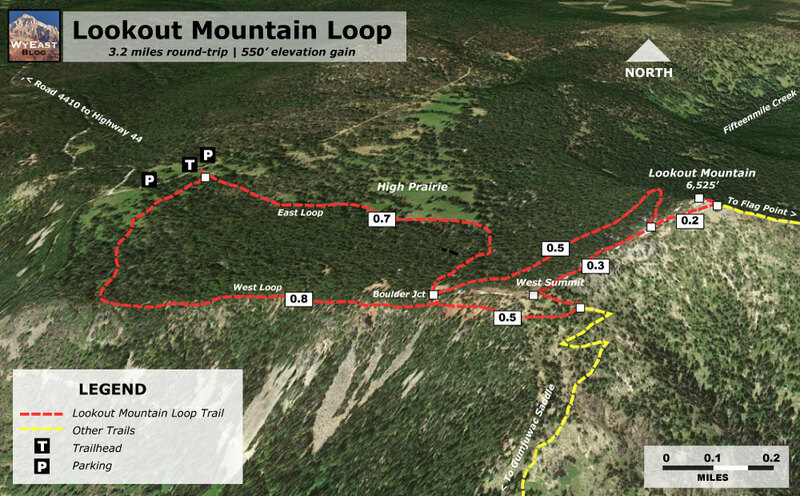 The full loop covers just 3.2 miles and climbs about 550 feet, and the sweeping summit views provide a big payoff for the moderate effort. Though the trail is usually snow-free from late June through mid-October, the hike is best in late July and early August, long enough after snowmelt to be mostly bug-free, but early enough to enjoy some of the wildflowers that summer brings to the mountain. The best way to hike the loop is to start with the west leg. 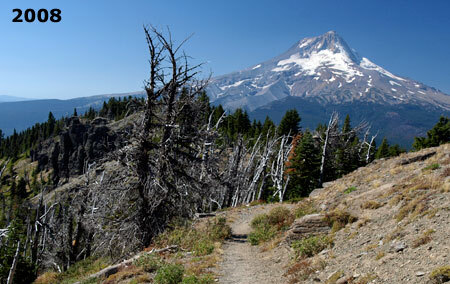 This is a rustic trail that immediately heads to the right from the High Prairie trailhead, gently climbing through beautiful meadows and open forests. 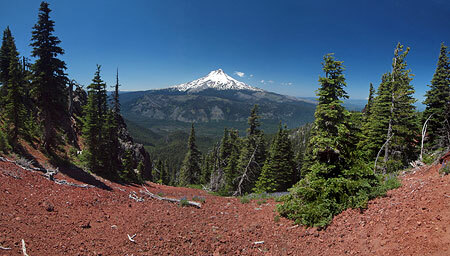 Stay straight where boot paths appear from both sides at about 0.8 miles, and soon reach the first dramatic view along the hike: Mount Hood, framed by a brick-red slope of volcanic cinders and spires. At about 1.3 miles, the west leg meets the Gumjuwac Trail on the south slope of Lookout Mountain. Turn left here, and soon reach the west summit of Lookout Mountain, with a commanding view of Mount Hood and the East Fork Hood River valley, more than 3,000 feet below. 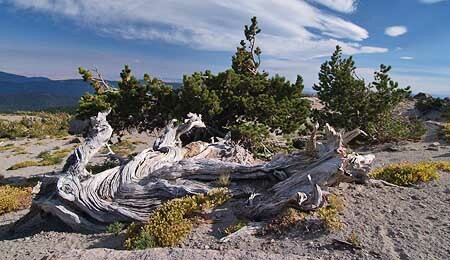 The flat rock outcrops here make for a nice destination in their own right, but to see the old Whitebark pines, you’ll want to continue the hike. The trail now turns east, and follows the summit crest of Lookout Mountain, with several dramatic viewpoints and interesting rock outcrops along the way. 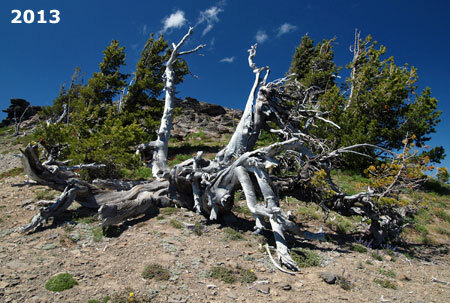 A number of Whitebark pine also line the trail, though these trees are protected enough to be in an upright form. The views from the crest are into the winding canyons of the Badger Creek valley, to the south. The summit crest traverse continues for about 0.3 miles before reaching the old lookout road in a saddle below the main summit. To reach the top, go right (uphill) on the old road and pass through one of the decimated Whitebark stands as you near the main summit of Lookout Mountain. You will reach the summit about 0.2 miles from the saddle, where you can see the crumbing foundations of the 1930 lookout structure and nearby garage. 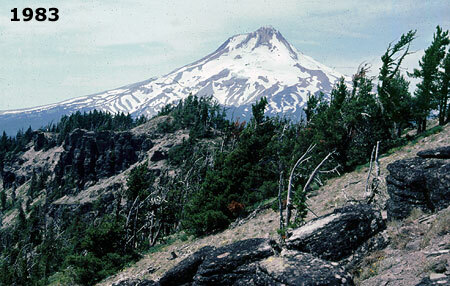 From the summit, views extend far into the high deserts of Eastern Oregon, south to Mt. Jefferson and the Three Sisters and north to Mt. St. Helens, Mt. Rainier and Mt. Adams. Mount Hood dominates the western skyline. A bit closer are the meadows of High Prairie, where you started your hike, and the tiny lookout tower atop Flag Point, to the east. Badger Lake can also be seen nestled in the forested wilderness to the south. 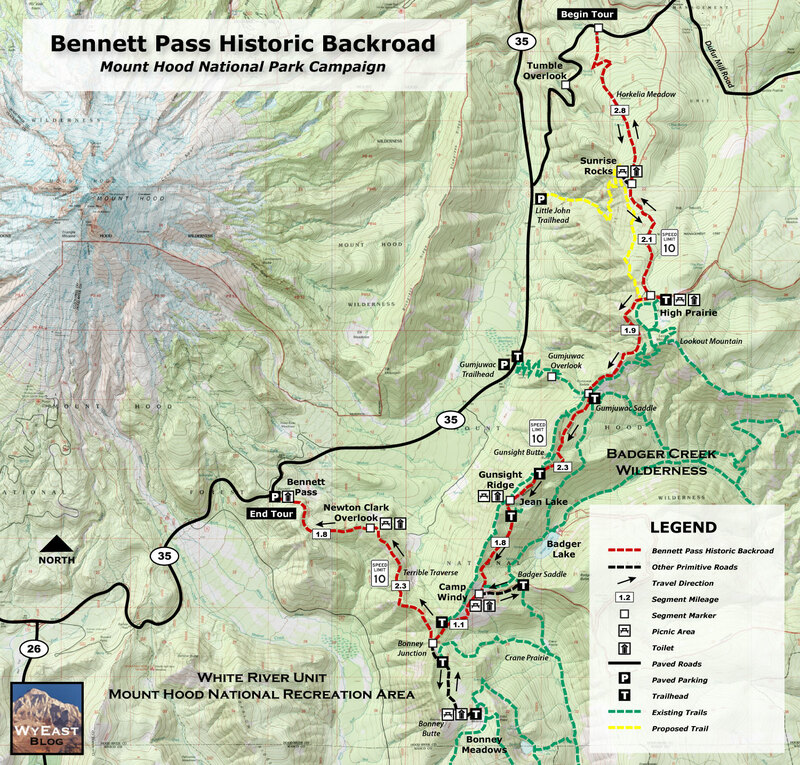 To complete the east leg of the loop, simply follow the old lookout road back to the trailhead, passing through handsome mountain hemlock forests and the upper meadows of High Prairie along the way. 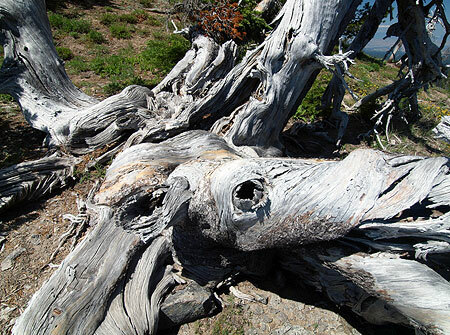 To visit the patriarch Whitebark pine described in this article, watch for the Divide Trail on your left as you descend from the top — just a few hundred feet from the summit. The patriarch tree is on the left, just a few yards down the Divide Trail. Use care around the tree so that future generations can enjoy its beauty — whether still living or as a bleached reminder of what once was. To reach the trailhead at High Prairie, follow Highway 35 from Hood River (or Government Camp) to the Forest Road 44 junction, where signs point to Dufur and Camp Baldwin. Drive 3.8 miles on this paved road and watch for a poorly signed, gravel Road 4410 on the right. Follow this dusty collection of washboards and potholes for 4.5 miles to High Prairie, turning right at a T-intersection in the meadow to drive the final 200 yards to the trailhead. A Northwest Forest Pass is required to park here. Pit toilets are provided. Carry water, as no reliable sources are found on this hike.